This week’s readers may notice a slight redesign of this publication. With the codification of our core beliefs I will not only recognize random examples of excellence. When I see amazing things taking place I’ll offer appreciation and share those actions in light of the beliefs they exemplify. The Cañon City High School JROTC Color Guard kicked off our annual All-Staff Gathering with the presentation of colors. 360 staff members attended put to four breakout sessions each at this year's Professional Development Fair. To begin, I want to thank new Cañon City Middle School principal Jesse Oliver for guiding a spirited discussion with his staff after we unveiled our core beliefs. In doing so, he took a risk by asking his staff to think critically about them and to grow personally. The CCMS staff has voiced concern about core belief number 4, we emphasize what is good for kids over the needs and comfort of adults. Both Mr. Oliver and I want to ensure everyone this belief is rooted in how we can provide richer life and learning experiences for students and not in how we might force unnecessary change on educators. While we’ll emphasize what is good for kids over the needs and comfort of adults, we’ll continue to lend voice to staff as we COLLABORATIVELY decide what our children need most. Assistant Superintendent of Schools Adam Hartman, his Administrative Assistant Racine Foster, and a cadre of staff leaders exhibited our belief learning growth matters most, requires risk-taking, and that the work we do in our schools has the greatest impact on this. They did so by coordinating and offering 69 breakout learning opportunities, one hour in length each, to 360 total participants during our 2018 Professional Development Fair. In fact, I venture to say all 360 PD Fair participants exemplified this belief by attending up to 4 sessions each, taking what they learned to apply in their current work situation. As I wrote last week, hiring and orienting dozens of new staff each year is no small task. Though I thanked Director of Human Resources Misty Manchester, her Administrative Assistant Casey Bursha, and New Teacher Support Coach Jamie Davis for their hard work supporting our new employees, I believe our new JROTC instructor at Cañon City High School Colonel Lance Peterson said it best in an email he was kind enough to share. He wrote, "I wanted to take a moment and extend my appreciation for the orientation week you all crafted for new employees. With over 36 years of military and corporate jobs I have held, I have never experienced an "on-boarding" as I did last week. I hold each of you responsible for making it such an impressionable and memorable event. I can not fathom the amount of time, or effort, it took to put that orientation together, but what was evident from everyone involved was there passion for this city, the school district, and most of all, the kids. I am proud to be a new member of this family!" It just goes to show you that sometimes emphasizing what is good for kids can also address the needs of adults! Of course our first core belief declares we meet the social-emotional needs of all students, putting Maslow’s Hierarchy of Needs before Bloom’s Taxonomy. As we seek to live this, we offered all K-12 staff a half-day introductory lesson in social-emotional learning in three shifts last week. I thank Regional Health and Wellness Coordinator Brain Vaniwarden and Social-Emotional Learning Coordinator Jamie Murray for the outstanding work they did on these presentations. Related to this, I was copied on another thankful message. Harrison K-5 Counselor Dinah Navarette wrote, “I just wanted to share with everyone that for the first time in 20 years I was able to complete my teaching schedule on my first day back to work! Our teachers seem to be excited about having me come into their classrooms to deliver Social-Emotional Learning. I plan on getting into the classrooms beginning Monday, August 27th and will be starting the Random Acts of Kindness Curriculum." Finally, our Lindamood-Bell Summer Reading Academy instructional team consisting of Kelli Jones, Lacy Ledoux, Amanda Dean-Moore, Michelle Zimmerly, Tara Oliva, Tonya Fisher, Kristen Brown, Joni Sullivan, Katie Fleetwood, Ben Shonkwiler, Jessica Stevens, Susanna Florom, Cassie Norden, Ben Brunson, Tracy Hash, Tisha Hance, and Jen Newton have a lot to be proud of. The program experienced great attendance and our students showed outstanding growth in only four weeks. This would not have been possible without our Washington Elementary Custodial Staff Kevin Harthun, Janet Wahlborg, and Kyle Stevens, bus drivers Taryn Browne and Michelle White, and Nutrition Services staff Randy Erwin and Janelle Grooms. All of these folks supported our belief that learning growth matters most, requires risk-taking, and the work we do, whatever that work, has the greatest impact on this! 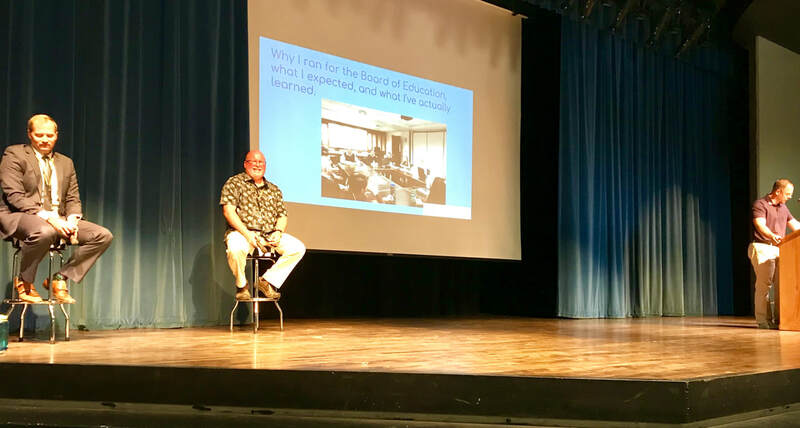 Assistant Superintendent of Schools Adam Hartman, Board Director Shad Johnson, and I presented information about a possible adjustment to our district vision and mission at our annual All-staff Gathering. Kristyn Econome's influence on our board of education will be greatly missed. With the resignation of Kristyn Econome from our Board of Education (to accept a position as Cañon City High School Spanish teacher) we’re seeking persons interested in filling her seat for the remainder of her term, through November 2019. Colorado law (C.R.S. 22-31-129) says a board of education has 60 days to appoint a qualified person to fill a vacancy. To be considered to fill Ms. Econome’s open seat an applicant must be a registered voter residing within school district boundaries for at least 12 months prior to taking office and never have been convicted of a sexual offense against a child. We ask interested persons to submit a letter of introduction to the district office by 4 PM Friday, September 7th, 2018. Our four remaining Board Directors plan to conduct interviews on Tuesday September 18th and Wednesday September 19th from 4 PM to 6 PM with the goal of appointing a replacement on Monday September 24th. If a majority of the Board can not agree on a single candidate within a 60 day time frame state law allows the board president, in this case Mr. Larry Oddo, to make the appointment unilaterally. During a video session Paula Buser prepares to explain door and window security to staff. Certainly the most impactful work we did about our future focus was challenging the entire district staff to remember what life was like when the Class of 2018 first came to kindergarten, how much the world has changed since then, and what changes we might expect to take place between next week, when the Class of 2031 shows up for kindergarten, and the time they graduate. Board Director Shad Johnson, Assistant Superintendent Adam Hartman, and I guided this conversation and this is the basis of our 3rd core belief, we’re future-focused, believing the development of certain traits and skills will best prepare our students for ever-changing careers. If something bad were happen to you or at your school, such an active threat, accident or a medical emergency, your employee ID badge will serve as a personal ID card allowing first responders to immediately identify who you are. Employee ID badges have become an intrinsic part of our work culture. The scope of our ID cards will continue to evolve in the future (providing building access, computer access, etc). For the time being, it is an important security/safety feature that is just one of the many ways we make our district more secure. Our employee badges provide an identification method to distinguish employees, contract workers, volunteers. and guests. Please, please, please do what is best for the safety and security of our kids, over what might be comfortable for you as an adult, by wearing your badge to work every day! With Chromebooks soon to be in the hands of all high school students, and already in the hands of all middle and high school staff, our technology department has been hard at work establishing user accounts and setting up processes by which folks can print and scan items to and from their devices. This has been no small task and I want to thank them all for their effort! Social-Emotional Learning Coordinator Jamie Murray presents key SEL concepts to Cañon City High School staff. With children arriving on our school campuses next Wednesday we’re in the midst of a final push to get our new secure entires completed. As of Friday afternoon work was continuing on the various electronic devices needed to operate each of them. On Monday I attended a board work session and meeting. I also continued preparations for our annual All-Staff Gathering, which took place on Tuesday along with our PD Fair. On Wednesday and Thursday I dropped in on school level staff collaboration meetings and social-emotional education training. On Friday I attended the Harrison K-8 Kids At Hope kickoff presentation. On Friday the Harrison School staff proudly accepted certificates of completion for completing Kids At Hope training. Pictured with them is Kids At Hope founder Rick Miller. This work aligns perfectly with our first core belief, we put Maslow before Bloom. Monday is the first day of school for Mountain View Core Knowledge students. I hope to join in on their annual red carpet clap in. I also have a series of routine meetings and I plan to attend a Fremont County Boys and Girls Club Open House event. On Tuesday we have our new classified staff orientation, a Superintendent’s Advisory Council meeting, and a Design Build team meeting. I’ll also be presenting the weekly program at the Noon Lions Club, and then I’ll attend our Regional Employee Wellness Fair. Wednesday is the first day of school for all remaining grade K-9 students (except for CCMS 7th and 8th graders). It is only a half-day. On Tuesday evening I’ll attend a planning and zoning meeting related to our new Washington Elementary school project. On Thursday I’ll travel to and from Denver for am Early Childhood Leadership Commission meeting. My Friday schedule is pretty open, but I look forward to starting my day by taking my daughter Priscilla to her first day of school as a sophomore at Cañon City High School.